A speech at a funeral is known as a eulogy. It’s a way to say goodbye and let everyone remember their loved one. There are no rules as to what you should say yet as we found that over two thirds of bereaved UK adults are often lost for words, we’ve created a guide to help you find the right words and some advice below to get you started. Funerals make connections bringing family and friends together. You may often find it difficult to give a eulogy as there is a big sense of responsibility whilst also having to cope with your own strong feelings. 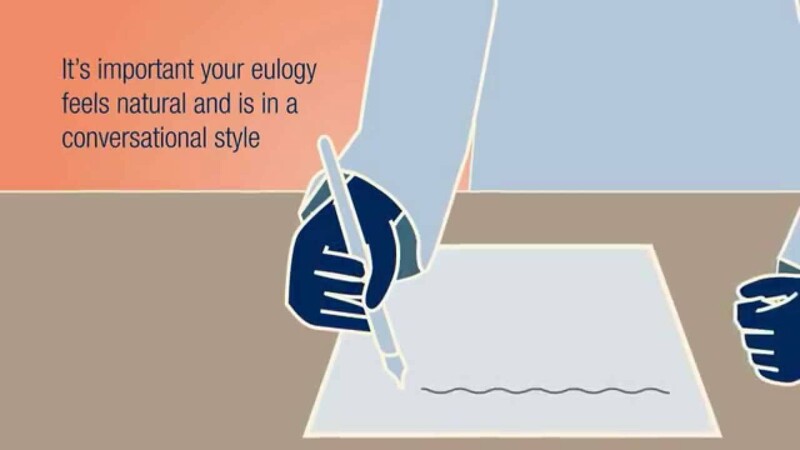 However, the eulogy is a vital part of the ceremony, offering you the chance to remember your loved one and share their life. If you could say only three things about them, what would you say? This can really help focus your speech. Think about everything that they were to you, and how they impacted your life. What made them special? Any favourite pastimes, interests, likes and dislikes? What are the highlights of their life story? Draw on memories of their life, including having children or scoring a winning goal – anything that made them truly happy. Ask siblings, friends and family about times they shared and times they would have been proud of. And don’t forget to think about how they would like to be remembered. Decide on the tone.Do you want it to be light hearted or formal? A letter, a poem or a simple few words? Divide it in to three parts, beginning with their childhood and working through the highlights of their life. Or beginning with the recent past, then working backwards. Alternatively, you can write it as a letter to them. Think about how that person would like to be remembered. Pick favourite memories of your own and ones that others will remember too. Try to mention the people who were closest to them. Keep it light hearted and add a bit of humour if you can. It can be easy to become morbid at a sad time but try to celebrate the person who has passed. Try not to over complicate it. Keep it simple and sincere. Avoid clichés like “We are gathered here today…” and begin as you mean to go on, with something special to that person. In fact, you don’t really need an introduction: people know who you are and why they are there. Practice aloud first so that you are familiar with the words, you understand how long it will take and where to put in pauses if necessary. And remember, if you change your mind about delivering the eulogy, it’s OK to ask someone else to give the speech on your behalf. The popularity of poetry is growing as over a third of people have encountered a poem when saying goodbye to a loved one. Goodnight, and joy be with you all. God bless, and joy be with you all. So don't you ever cry. And it will heal the scars. Nor, when I’m gone, speak in a Sunday voice. O soft embalmer of the still midnight! And seal the hushèd casket of my soul. Nothing is past; nothing is lost. One brief moment and all will be as it was before only better, infinitely happier and forever we will all be one together with Christ. Do not shed tears when I have gone but smile instead because I have lived. Do not shut your eyes and pray to God that I'll come back but open your eyes and see all that I have left behind. I know your heart will be empty because you cannot see me but still I want you to be full of the love we shared. You can turn your back on tomorrow and live only for yesterday or you can be happy for tomorrow because of what happened between us yesterday. You can remember me and grieve that I have gone or you can cherish my memory and let it live on. You can cry and lose yourself, become distraught and turn your back on the world or you can do what I want - smile, wipe away the tears, learn to love again and go on.